The aerospace & military Auxiliary Power Unit (APU) market was valued at USD 1.53 Billion in 2014 and is projected to reach USD 1.85 Billion by 2019, at a CAGR of 3.92% during the forecast period. The objective of this study is to analyze, define, describe, and forecast the aerospace & military auxiliary power unit (APU) market based on application, country and region. The report also focuses on the competitive landscape of this market by profiling companies based on their financial position, product portfolio, growth strategies, and analyzing their core competencies to anticipate the degree of competition prevailing in the market. This report also tracks and analyzes competitive developments, such as partnerships, mergers & acquisitions, new product developments, and research & development (R&D) activities in the aerospace & military Auxiliary Power Unit (APU) market. The base year considered for this study is 2013 and the forecast period is from 2014 to 2019. The research methodology used to estimate and forecast the aerospace & military auxiliary power unit (APU) market includes the study of data and revenue of key market players through secondary resources, such as annual reports, Yahoo Finance, Federal Aviation Administration (FAA), International Civil Aviation Organization (ICAO), International Air Transport Association (IATA), and Stockholm International Peace Research Institute (SIPRI). The bottom-up procedure was employed to arrive at the overall size of the aerospace & military Auxiliary Power Unit (APU) market from the revenue of key market players. After arriving at the overall market size, the aerospace & military auxiliary power unit (APU) market was split into several segments and subsegments, which were then verified through primary research by conducting extensive interviews with key industry experts, such as CEOs, VPs, directors, executives, and engineers. These data triangulation and market breakdown procedures were employed to complete the overall market engineering process and arrive at the exact statistics for all segments and subsegments. The aerospace & military auxiliary power unit (APU) market has been segmented on the basis of application, country and region. Honeywell (US), Microturbo (France), UTC Aerospace Systems’ subsidiary- Hamilton Sundstrand (US), and Pratt & Whitney-subsidiary of United Technologies (US) are some of the manufacturers in this market. Contracts, new product launches, agreements, and acquisitions are the major strategies adopted by the key players in the aerospace & military Auxiliary Power Unit (APU) market. The aerospace & military Auxiliary Power Unit (APU) market is projected to grow from USD 1.53 Billion in 2014 to USD 1.85 Billion by 2019, at a CAGR of 3.92% from 2014 to 2019. The increasing aircraft deliveries across the globe, as well as the retrofit activities in the general aviation market, are expected to fuel the growth of the aerospace & military Auxiliary Power Unit (APU) market. 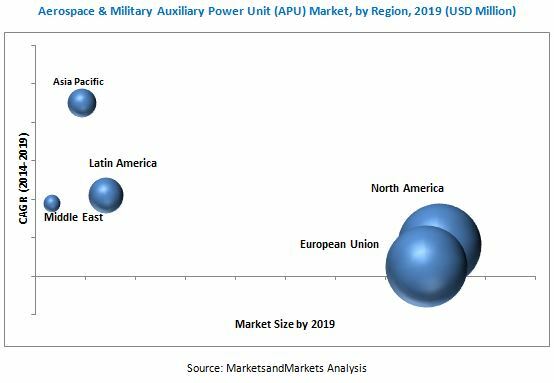 The aerospace & military Auxiliary Power Unit (APU) market has been segmented on the basis of application, country and region. Based on application, the aerospace & military Auxiliary Power Unit (APU) market has been segmented into commercial and military which is further segmented into fixed wing rotary wing, UAV, and military land vehicle. The commercial segment is projected to lead the market during the forecast period, owing to the increasing demand for commercial and military fixed wing aircraft. The commercial fixed wing aircraft market is anticipated to increase due to the growing air passenger traffic. Based on commercial aircraft market, the aerospace & military Auxiliary Power Unit (APU) market has been segmented into Very Large Aircraft (VLA), Wide Body Aircraft (WBA), and Narrow Body Aircraft (NBA). The Narrow Body Aircraft (NBA) segment is expected to grow at a high rate during the forecast period. Based on region, the aerospace & military Auxiliary Power Unit (APU) market has been segmented into North America, Latin America, European Union, Asia Pacific, and Middle East. The North American region is estimated to be the largest market for Auxiliary Power Unit (APU) in 2014. Presence of major aircraft manufacturers, such as the Boeing Company (US) and Bombardier Inc. (Canada) is driving the aerospace & military Auxiliary Power Unit (APU) market in this region. The aerospace & military Auxiliary Power Unit (APU) market in the European and Asia Pacific regions is also expected to witness a high growth due to the rising demand for wide body and narrow body aircraft. Technological drawbacks in aerospace industries can act as a restraint for the aerospace & military Auxiliary Power Unit (APU) market. Major companies profiled in the report include . Honeywell (US), Microturbo (France), UTC Aerospace Systems’ subsidiary- Hamilton Sundstrand (US), and Pratt & Whitney-subsidiary of United Technologies (US).